Roxy Jacenko’s fashion blogger agency Ministry of Talent is charging $200 for brands to advertise on her two-year-old daughter’s Instagram feed, an investigation by the Australian Women’s Weekly (AWW) has uncovered. 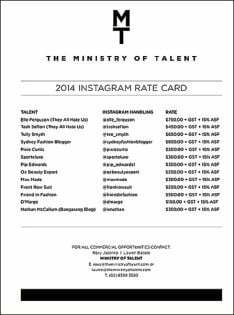 The magazine has published the rate card for the agency, with brands paying $750 for an Instagram photo with high profile fashion bloggers such as Elle Ferguson, as part of an investigation it has done into the world of fashion blogging. The highest rate charged by the agency is $850 for Sydney Fashion Blogger, with the cheapest O’Marge charging $150 for brands to be featured on the Instagram feed. Brands must pay $200 to plug products via Jacenko’s two-year-old daughter Pixie Curtis’s Instagram feed. The prices are also subject to additional GST and a 15 per cent agency service charge. 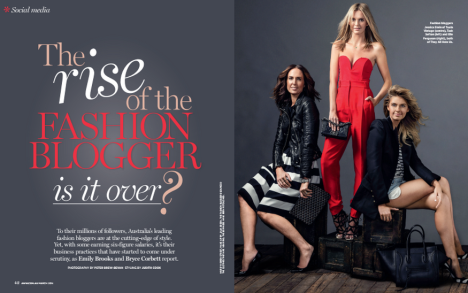 In the article, which went on sale yesterday, the magazine highlights the regulatory issues around paid blogging and the challenges the emerging space faces around disclosure, highlighting the recent ruling by the Australian Consumer and Competition Commission (ACCC) which has released new rules around disclosure and online product reviews with potential fines of up to $1.1m for breaches. There are also growing tax issues around the revenue bloggers receive from brands, with some of those named in the article mentioning 20-30 brands a week on their sites or social media presences and claiming up to 70 per cent of posts are sponsored. Fashion blogger agent Jacenko, who also runs the PR agency Sweaty Betty, said she was comfortable with the agency’s practices and her decision to include her own daughter on her client roster. Speaking to Mumbrella via email this morning Jacenko stood by her agency’s practices, saying: “Our bloggers list on their blog posts if a post is paid and will continue to do so if and when a post is placed and remuneration is received by the talent.” She noted many bloggers also have ambassadorial roles with brands. “I pose this – if Louis Vuitton took a full page advertisement in Harper’s Bazaar would they hope to receive cut through via product placement on the editorial pages of the magazine in the issue and subsequent issues in addition to their spend on the full page ad as part of their added value or ROI? Most certainly! Do you see fashion spreads and flat lay pages saying ‘SPONSORED’? No. The full article is available in the March edition of The Australian Women’s Weekly which is now available. This issue and in particular this story is an excellent read. Well done Bryce and Emily. This issue and story is not excellent to read Lauren, this if anything is absolutely pathetic. A 2 year old requiring instagram, clearly she is posting these up. Oh for goodness sakes, I’m so glad Australia has turned to this crap. News like this aggravates me. I’ve been waiting for this feature to be written. I cannot see one sponsored post declared on any of these blogger’s Instagram feeds OR blogs. It is very misleading to their fans who assume who rightly assume the blogger has chosen to wear an item or use a product. And I would think that every reputable magazine and newspaper in town would disagree with Roxy about the line between editorial and advertising. Interesting article. Google have clamped down on “guest blogging” in terms of paid advertorials, so Social Media will certainly be a new sport to manipulate users exposure to brands, especially if your rate card looks like that! I’d love and article like this written about YouTubers. Speak to BOOM. Maker Studios. Machinima etc. Disclosure is rare here too. What disappoints me most about the AWW article is that the writers have concentrated on the minority of bloggers who don’t disclose commercial arrangements and gifts. Most Australian bloggers I know have been upfront about this – long before the ACCC’s rulings. I’m a full-time blogger and have respect for my readers – it is always clear to them if there is a commercial relationship with the brand I’m posting about. Nikki – the few who break the rules are always going to spoilt it for the many. Sadly, the few who don’t are also the biggest in Australia – you know who they are. The ones who are so big and famous that the rules don’t apply to them. Part of me died on this inside reading this story. Is this really where we’ve come as a society? I find the AWW investigation and subsequent article one sided and disingenuous. Like Nicky @ Styling you, I am a full time blogger too. I have a strict and very transparent editorial policy – we don’t run any paid content / advertorial / ‘integrated’ content or whatever you want to call it. We just don’t do it. Never have, never will. I make a fulltime living and pay my staff and collaborators from income derived purely from clearly designated banner advertising revenue alone. It is possible to do this, MANY bloggers do not run sponsored content at all, and many of those who do, do so fairly and transparently. I never thought I’d agree with anything Roxy Jacenko says but her example about Louis Vuitton / Harpers Bazaar is absolutely spot on. Advertising in glossy magazines has trained fashion brands to expect editorial coverage and inclusion of their productrs within photo shoots etc. It is an unspoken expectation. Additionally, Magazine editors and writers receive countless freebies and perks from fashion and beauty brands, which often results in editorial and social media coverage. I’m all for editorial transparency, but I’m sick of established print media constantly pointing the finger at bloggers on this front. Magazines are clearly threatened by the rise of prominent bloggers, and the AWW article says more about that threat than it does about blogger editorial policies. As a blogger myself, I can tell you that ,ost of the bloggers I know do disclose and many ‘over’-disclose whether it’s a sponsored tweet or the whole article. As for those who don’t disclose well, we can’t judge them either. At this stage, in Australia there are no legal requirements to do so. In US, for example, it is required by law and there are clear direction how to do it, so there is no grey area. Finally, something to think about… bloggers chose what they write about even if it’s a sponsored post. I don’t know a single (big) blogger who would sacrifice their own brand, their integrity and their readers trust for a momentary, monetary benefit. I can’t say this about every single blogger but… BUT! big bloggers are big for a reason, and to think that every blogger is a sell out with dodgy practices is a huge mistake. The issue here is these bloggers (not all) are not paying tax on the gift/products they are receiving. In effect this is an income which they need to declare. No wonder Australia is in the state it is in. Everyone tries to get out of paying tax.